Skoda has not released detailed pictures of the Karoq. This spy shot shows that the model shares styling cues with the larger Kodiaq. Skoda says its Karoq compact SUV will be a key model in helping to drive its sales to further records. Skoda released details of the Karoq on Friday in a statement that said the brand's primary focus will be on broadening its SUV range. 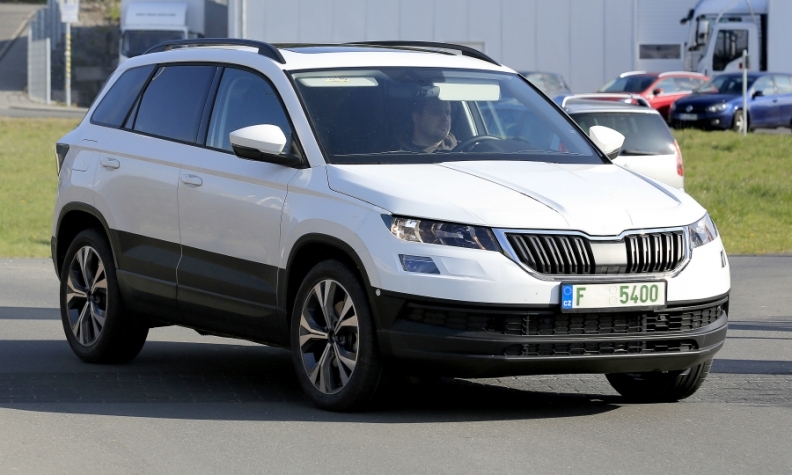 The Karoq will replace the Yeti crossover in Skoda's lineup and join the Kodiak, Skoda's first large SUV. Skoda is also said to be developing a subcompact SUV. The Koroq is underpinned by parent Volkswagen Group's MQB platform like the VW Tiguan and Seat Ateca compact SUVs. Skoda touted the model's roomy interior and large trunk as selling points. The 521 liters of trunk capacity grows to 1,630 liters with the rear seats folded down. The seats can also be completely removed, increasing load capacity to 1,810 liters, Skoda said. The Karoq's connectivity and safety features will include a WiFI hotspot, compatibility with Apple CarPlay and Android Auto and wireless phone charging. Safety features include parking, lane and traffic-jam assistance systems and Front Assist, which offers predictive pedestrian protection. The engine lineup will be two gasoline and two diesel units with displacement ranges of 1.0, 1.5, 1.6 and 2.0 liters. The 1.5-liter gasoline engine has cylinder deactivation to help reduce fuel consumption. There will be an all-wheel-drive variant. 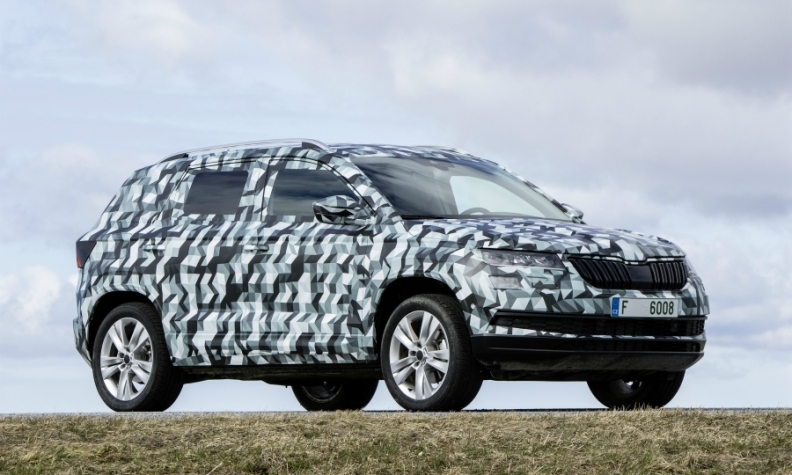 Skoda has released some images of the Karoq in camouflage. Just as it did with the Kodiak, Skoda has given the Karoq a name linked with Alaska to associate the model with the outdoors and adventure. The Kodiak's name links it with a bear and an Alaskan town. Karoq is said to come from the words 'Kaa'Roq,' which mean 'car arrow' in the language of an indigenous Alaskan tribe. It is also a reference to the arrow in the Skoda logo. Skoda said the Karoq will have its official launch on May 18 in Stockholm, ahead of a sales start in the second half. Its public debut is expected at the Frankfurt auto show in September. Skoda's global vehicle sales rose 6.8 percent to 1.13 million last year, a record for the brand, and by 2.5 percent to 283,500 in the first quarter, the best result to date for the quarter. In the mid-term, the brand aims for 1.5 million sales annually, boosted by its new SUVs.